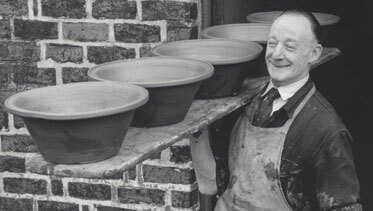 There is a famous film of Isaac Button, country potter, made in 1965. He was about 70 when when it was made and the last person working at Soil Hill Pottery near Halifax, Yorkshire. His throwing skill was phenomenal. In this extract he is throwing 28 lb (about 15 Kg) into a cider jar. Quite apart from the mass of clay he uses and the speed at which he works, this is a particularly difficult shape, with its full belly and narrow neck. You can see that even with his experience the shoulder of the jar goes into a wobble, something very common with less experienced potters like me when making jugs with narrow necks. Isaac Button’s father bought Soil Hill Pottery in 1897, demolished the old buildings and made a new pottery, which he passed to Isaac. Isaac retired at about the time this film was made. By now (the age of the Beatles and the mini skirt) he was out of touch with the market, making products for a disappearing rural clientele and selling them absurdly cheap. He sold this gallon cider jar for £1.40 while Bernard Leach was selling a standard 30cm diameter bowl, made by his apprentices, for £2.60. But Isaac Button also made ornamental vases and cups, decorated with a contrasting slip, and sold them unfired to local people to decorate for themselves as a hobby, to be returned to the pottery for firing and glazing.